Bought this gadget after a quick review regarding the how Galaxy Notes fits the professionals who wish to use this gadget in their everyday works. I thought it fits my requirements and thus went to Sg. Wang and here it is! 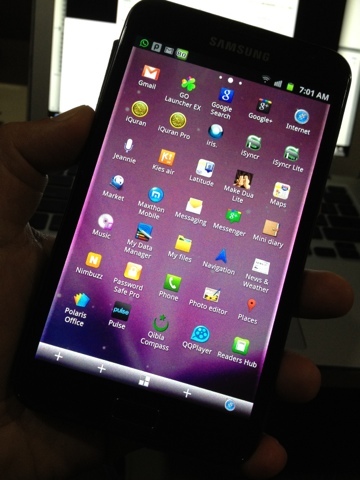 My first Android smartphone! I have always been an avid user and owner of Apple gadgets. To be one of the user that tries to move to the "dark side", I would say it was a really challenging one! Android user interface is like a "jungle" - You can virtually get yourself lost in it! Even though this Samsung model came with Gingerbread the GUI is still so unfamiliar to me! Getting around the apps and changing configurations are so difficult (for a person who have been using a simple GUI from Apple since the iPod and iPhone days). Initially I can virtually "vomit" and making me crazy. However, one particular application called "Aptoide" actually saves my Samsung Galaxy from being an expensive idle toy... You don't need to Jailbreak (iPhone style) to get a similar feature like "Aptoide". There are few things that attract me: the screen display and the S Pen feature. The screen is so much clear and because of its size, watching video is much better than the iPhone. S Pen is great during meetings whereby you don't want to carry bulky diary or notepads and just jotting down some notes. In a boring meeting session, its great for scribbling and making graffiti. I love its simple way to capture screenshots, edit and later email to friends or post to our favorite social websites.